At Footers Catering, we strive to not only create exceptional events, we also want to be an amazing place to work. We believe that an engaged and inspired company culture will produce the most genuine and motivated staff to take exceptional care of our clients. 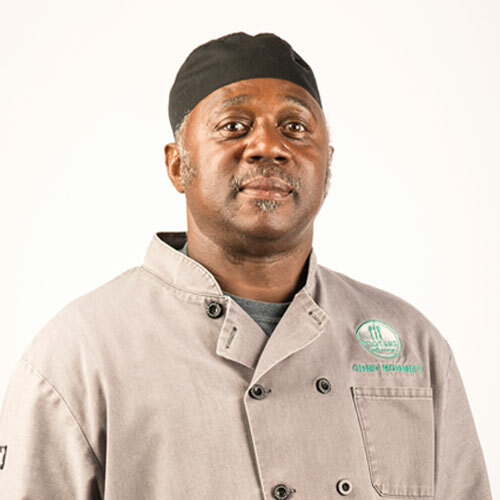 The Footers Catering management team consists of leaders in all five of our key departments: Culinary; Coordination; Rental Operations; Staffing; and Development. We use a team approach when working toward future goals. Monthly meetings with our core team are a platform to problem solve, update the team on the progress of other divisions, and determine the most important and immediate direction of the company. Most decisions are made in a collaborative manner where a team of employees come to a consensus on what will be best for the customer and the company. We're sorry. No people were found matching your selections. The People. We Love What We Do. Production & Design. Innovation and Creation. Client Experience. Hand Crafting the Footers Experience. Hospitality. Committed to Exceptional Experiences. Chefs de Par-tay. Dedicated to Great Food. Party Pilots. Heroes in Hospitality. Tastings Team. Bringing Your Vision to Life. 5-year Club. 1,825 days of Awesomeness. This is just a couple of songs that make me happy! They all have a memory tied to them and make me smile. Let me know if you are curious and I would love to share more! Colbért Callen has been with the Footers team since 2007. She was first introduced to the company when seeking out a caterer for her own wedding, and found the perfect fit not only for her special day, but also for a passionate career. Her amazing ability to translate a client's vision into a reality sets her apart in the event planning world. Her skill for envisioning an event is unmatched, and enthusiasm to see a client happy, is crucial to planning any event. Quote to live by: "Work Hard, Play Hard." My biggest motivator to go for three runs each week is my border collie, Harper. She knows when I put on a specific pair of shoes that there may be a run in her future, and at 13 years old she still lives for it. She always outpaces me, so music actually helps me keep up with her! 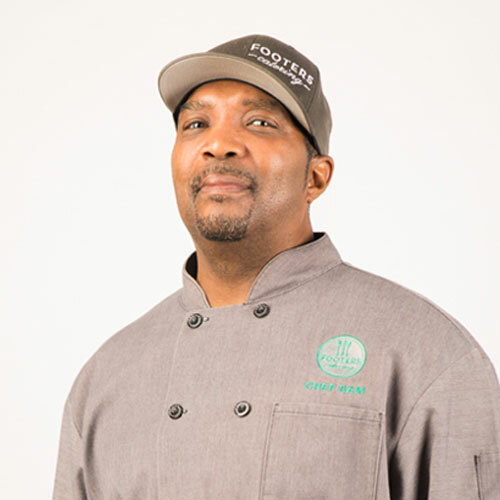 Sam Totten has worked for Footers Catering part time since he was 15 years old. 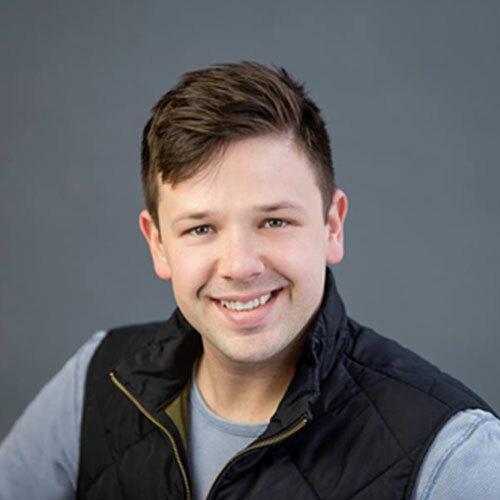 After graduating from Arizona State University with a Masters degree in Architecture, he returned to the Footers team full time in 2009. 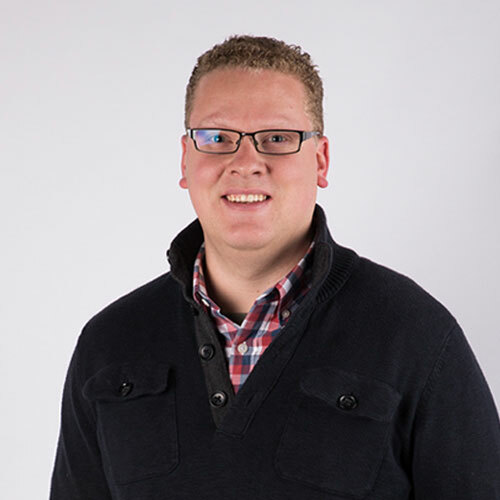 Sam is a "jack-of-all-trades," wears many hats, and uses his unparalleled passion and creativity to design cutting edge innovative displays, eye-catching marketing materials, efficiency enhancing digital tools, sweet company swag, and a bunch of other stuff! He is our walking Mission Statement and his ambitions to create, build, and make things better everyday show in all aspects of his work. Quote to live by: "The greater danger for most of us lies not in setting our aim too high and falling short; but in setting our aim too low, and achieving our mark." These are some of my go-to easy listening songs for sittin' on the back porch, doing work at the office, or driving up to the mountains for a weekend getaway. In any scenario, they're best enjoyed with friends! 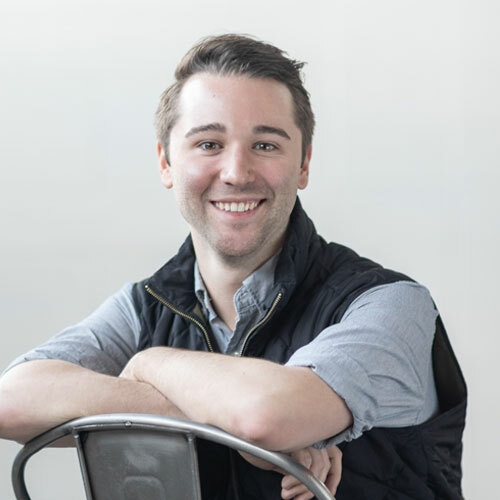 Jason Sutton was with the Footers family only three months before joining the management team as our Food Architect. His previous work as a Butcher and Chef in Chicago and Maui, Hawaii has leant him an incredibly versatile knowledge of flavors. Jason's unwavering upbeat personality keeps our culinary team one of the best Denver has ever seen. One of my favorite ways to relax and enjoy a day is hanging out and playing with my 2 year old daughter. We love playing outside, making messes, and trying new foods together, and these songs are usually playing in the background in the kitchen or car as we spend time together. Lindsey Gertz has been a part of the Footers team since 2006. Her passion for perfection is contagious, and her attention to detail helps to make some of Footers' largest events go off without a hitch. Her creative ideas and eagerness to be on the cutting edge of the event world keeps all of us reaching for something new. Recently Lindsey added to the Footers Family with her son Landon and daughter Audrey. Lindsey enjoys the flexibility of working for a family owned business; it allows her to be an active Mom and career woman. One of my favorite ways to spend an evening is with my family! Whether we're playing in the backyard, the two kiddos are helping us make dinner, or we're relaxing and enjoying our fire pit, these songs are the perfect background to lots of fun and laughter! Jamie Shaw is from Indianapolis, Indiana and moved to Denver to pursue a degree in Event Management from Johnson & Wales University. After completing her Bachelors Degree, she started her career at a local Country Club planning everything from golf tournaments to weddings! From there, she moved into full-time Wedding Planning, which is where she found her true passion in catering a wide variety of events. Jamie loves to see an event start at just an idea or concept and develop into a special and memorable event from start to finish! Here are my favorite jams to listen to as I get ready to workout, a night out, or head to an event. These are my go tos anytime I need a good pick me up! Stephanie Zemler has been working in the hospitality/catering industry since 2007. She graduated from the Art Institute of Colorado with a degree in Culinary Arts. Her experience in catering ranges from office management, event coordinating, bartending, and cooking. She became a part of the Footers family in 2012 and shortly after took on the role as staffing coordinator. In 2016 she transitioned her role into "The Curator of Creativity". Her main area of focus is designing unique displays and creative food presentations for our events. Stephanie also uses her expertise in executing events as part of our internal logistics team and the training of our amazing Service Team. These songs bring a smile to my face as they remind me of fun times in my 20's! Ask me more about my travels, favorite concerts, and friends I shared these memories with! Colleen Hartigan joined the Footers family in September of 2015. 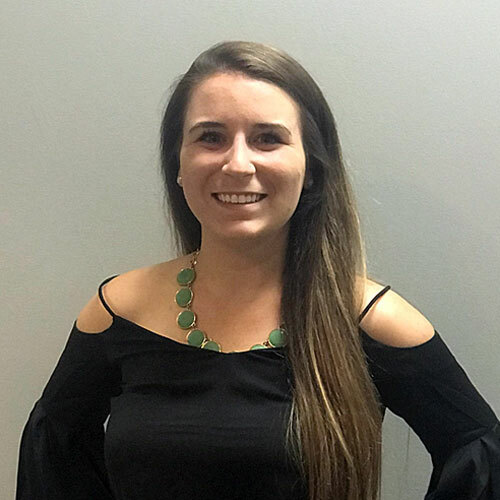 After obtaining a degree in Liberal Studies with a concentration in Hospitality from Endicott College in 2013, Colleen worked for a small events company out of Worcester, Massachusetts. There she was an Event Manager for two years. Her attention to detail and eagerness to succeed adds a unique spark to our team and she is always willing to go the extra mile in order to satisfy our clients and their guests! Away from Footers Colleen enjoys hiking, reading, craft beers, and cheering for Boston sports teams. I love to constantly surround myself with music. Whether it's a crazy show at Red Rocks, or calming myself after a rough day, music is always there for me! Here's a playlist of a couple of my absolute favorite songs ever, I hope you enjoy it as much as I do! 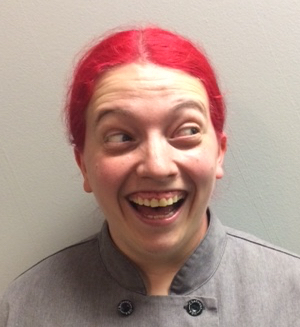 Shelby Anderson joined the Footers Family in the summer of 2016 as our Pastry Professor. She graduated from the Art Institute of Denver in 2013, but has known since childhood just how much passion she has for baking. 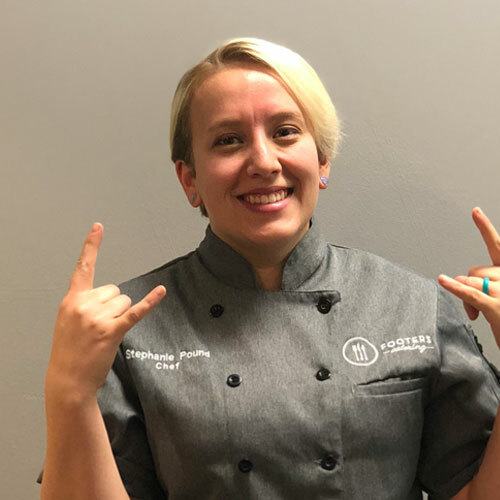 From working as a night baker at local cupcakeries to running the kitchen at some of Denver's favorite dessert bars, Shelby found her niche in the catering world and absolutely loves it. In her opinion, pastry can be a product of never ending possibilities, from baking bread to decorating cakes to plating intricate desserts, there's never a dull moment and ALWAYS something new to learn. Whether it's fresh throwbacks, sing-your-heart-out ballads, or solid jams to focus and concentrate to, these are my favorites to keep the energy high and spirits lifted as slay in the kitchen! Stop by the Pastry dept, on Wednesdays you'll find us wearing pink, and see what we're rocking out to! Kari Dismuke realized her passion for event processes and logistics after pursing a double major in Events & Tourism. She joined the Footers team in 2009, and with her knack for organization and a passion for all things involving details. After executing hundreds of events ranging from non-profits, social, corporate and weddings, Kari took on a new position in 2016 that showcases her versatility and love of logistics. She now focuses on creating and implementing internal processes that increase efficiencies, as well as spearheading our Culture Club Task Force to plan and execute all things relating to our Company Culture and the Footers Family! With Kari's attention to detail and ability to make things happen, there is no doubt the perfect title for her is the Detailed Diva! Quote to live by: "Life is like a camera, focus on whats important and capture the good times." No matter the time of year, you will find me day dreaming of a beach vacation. Here are some songs that I like to listen to while sitting on a beach in Mexico with a drink in hand! This is a mix between some of my favorite pump up music that I play to get in the mindset for boxing and then classical music which is usually what I listen to when I am winding down after a long day or workout! Krystal Hoeft is originally from Flagstaff, Arizona where she received her Business Management degree from Northern Arizona University. She moved to Denver in 2003 and lives with her Husband, two Daughters Kiera and Kinsley and two furry friends Fox & Kaya. She has over 14 years in the financial service industry and received her MBA from Regis University. 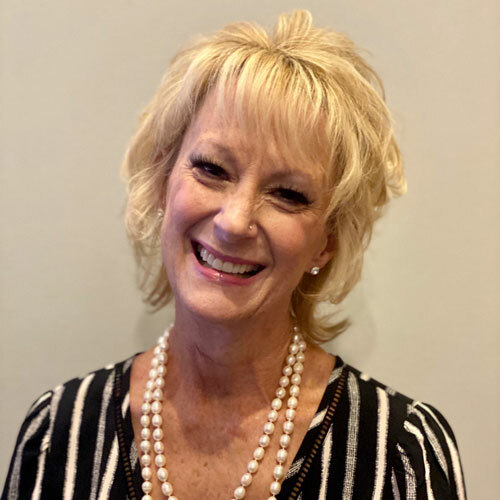 She joined the Footers Family in 2015 and oversees the day-to-day finance operations of the company and is in charge of all collections, disbursements, taxes and payroll. K & B Ranch is my dream come true! Our farm is a place where my family can spend time together, my girls can learn about taking care of our garden and animals, and we can enjoy the stunning beauty of Colorado! These songs remind me of the sweetest memories I have with my family on our farm together! Megan Stewart graduated from Colorado State University with a degree in Fashion Merchandising. She spent a few years working for luxury clothing companies when she transitioned to Membership and Catering Sales in the hospitality industry. Over the next 6 years Megan lead Food and Beverage Teams at many different Country Clubs, most recently the Country Club at Castle Pines. Having a high attention to detail, a commitment to excellent customer service and a passion for leading people has driven Megan's desire to be in the catering industry. Quote to live by: "Be somebody who makes everyone feel like somebody." There's nothing better than a good pump up mix! These are my go tos as I head out to an event and these songs never fail to pump me up and help me lead my team to execute another awesome event! Brittany Burrows joined the team after moving to Denver from Philadelphia, Pennsylvania. Upon completion of her degree in Business Management and Public Relations, she began managing a historic wedding venue in Pennsylvania and fell in love with the event industry. Brittany has a knack for connecting with clients and loves going the extra mile to make an event unforgettable! Sometimes on the way to an event, I need a little pick me up! This is a handful of the songs that never fail to put a smile on my face and prepare me for the day ahead. Katie Martineau joined the Footers Family after adventuring to Denver from Seattle, Washington. She attended the University of Minnesota Duluth and volunteered for a non-profit theatre, where she fell in love with planning large events, such as the theatre's annual Casino Night Gala. Hospitality positions at hotels Minneapolis and Seattle led her to the food and beverage side of hospitality. Whether attending networking events, snowboarding in the Rockies, discovering new hiking trails, or participating in fitness competitions, Katie is always ambitious for a new adventure. Denver is more country than the other city I’ve lived in and it’s definitely growing on me! I mean, we have a parade with big horned cattle walking down city streets – ha! This is more country-pop; achy-breaky-heart stuff is still a hard, no! Allison graduated from the University of Vermont in 2011 with a degree in Public Communication. After livingin Boston, she joined the Peace Corps and worked with youth in development in the Republic of Georgia. Upon returning to the States, Allison decided to pursue new adventures and move to Colorado, where shejoined Footers Cateringin July 2017. Allison strives to exemplify what Footers Family means to every one of our clients and guests. She also seeks to show how our culture of encouraging and fostering our unique passions and skills elevates our work into the realm of AWESOMENESS and truly sets our staff and our work apart! While the East Coast will always have a special place in her heart, Allison loves exploring Colorado's endless beauty. She seeks to fly fishevery bodyof water, hike every trail, and celebrate each day's end with a new local craft brew in hand. I took a 2.5 week cross country road trip when I moved from Boston to Colorado and fell in love with the independence and freedom found on the open and dirt roads. Here's my favorite driving playlist as I adventure and explore the beautiful state of Colorado! These are my personal favorite beats to run to. They keep me moving so I can actively run off the Footers family meals! Zach joined the Footers Family in the summer of 2014. 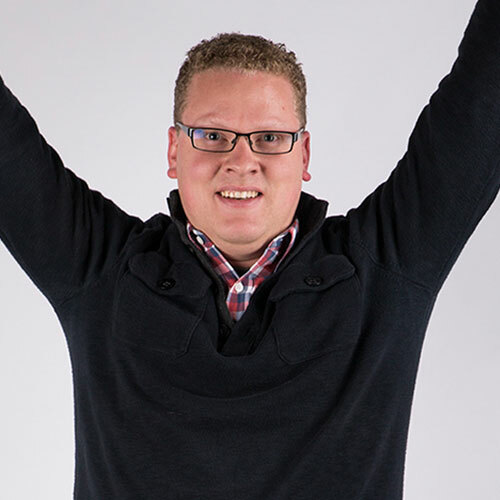 He began his time at Footers as a Hospitality Hero and then joined the Production team where he quickly moved up the ranks and is now the Warehouse Manager. Zach is a Colorado native who’s never been skiing or snowboarding! As a Colorado native, I've been lucky to grow up with the mountains right in my backyard! One of my favorite things to do is spend the day snowboarding. Here's some music that gets me excited as I make the drive out to spend the day on the slopes! Lewis joined the Footers Family in April 2016. 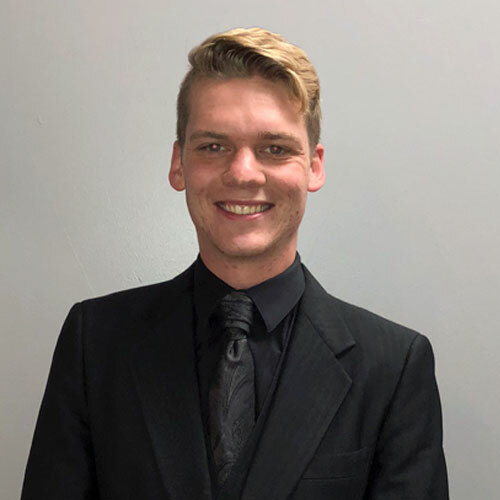 After receiving a Bachelor's Degree in Hospitality Management from Kent State University, Lewis worked at a hotel and conference center for two years. There he supervised and managed the restaurant, bar, and banquet programs. Away from Footers, Lewis enjoys hanging out with friends, trying new breweries, being a couch potato, singing in the car, dancing in the mirror, and playing with his dog, Charlie. These are my favorite and always classic songs that I love to listen to as I prepare for an event! Whether it's a carpool singing sesh with the team or songs I listen to as I review the Captain's packet, these songs help set the tone for a fun event and boosts everyone's confidence! Corrine has worked in the hospitality industry for 15 years. She started in restaurants, transitioned to being a banquet manager in hotels and has also worked her way around a few country clubs before joining the Footers Family. Corrine is from Cedar Rapids, Iowa. She loves working with and helping people and also enjoys traveling and spending time with family and friends! Kim Menghi is originally from Lock Haven, PA. She graduated from Lock Haven University with a BS in Secondary Education, English and German and earned a Master's of Instruction from the University of Delaware. Kim taught German, English/LA, Spanish, and Yearbook over the course of 32 years in Pennsylvania and Delaware. Upon retiring from public education in 2015, she moved to Frederick, Colorado, and began working for Footers in 2016. Since then, she has worked as a Hospitality Hero, Mix Master and Party Pilot, striving to always make every client and guest have the most fantabulous experience possible! Paige started working in the food service industry when she was in college doing everything from being a hostess, server, and bartender. She especially loved bartending because of how social the position is and loved all of the interactions between guests. 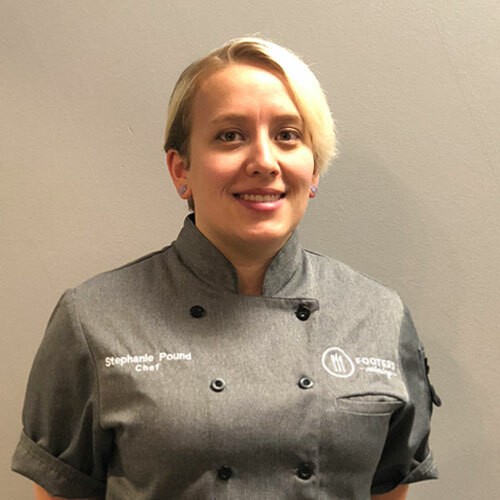 After graduating with a degree in Exercise Science from Appalachian State University, she moved to Colorado in September of 2017 where she started at Footers Catering. 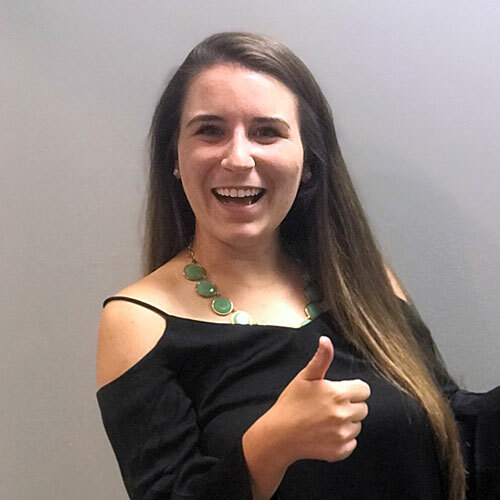 Paige has experience working as a Hospitality Hero, Mix Master, the Footers Front Desk in the office, and has now worked her way up to Party Pilot! Outside of Footers, Paige practices being the best dog mom she can be and spending as much time outdoor and hiking with my pup as possible! 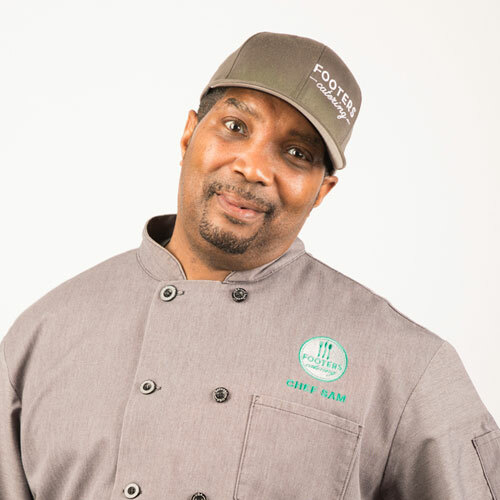 Ronney has been part of the Footers family since 2002, making him our most seasoned lead event chef. With his tenure, he brings a wealth of knowledge to the off-site catering world. Ronney has found an awesome balance between hard work and humor that makes him one of Footers most popular Chefs de Par-tay. Since coming aboard in 2005, Sam "Bam" has been lucky enough to give back to the school he attended as a youth, Mullen High School. Sam runs the culinary department at Mullen High School while simultaneously leading events on the weekends as a Chef de Par-tay. Dylan roots are in Oklahoma, where he studied Hospitality at Oklahoma State University. After completing his degree, Dylan moved to Colorado to hone his skills. 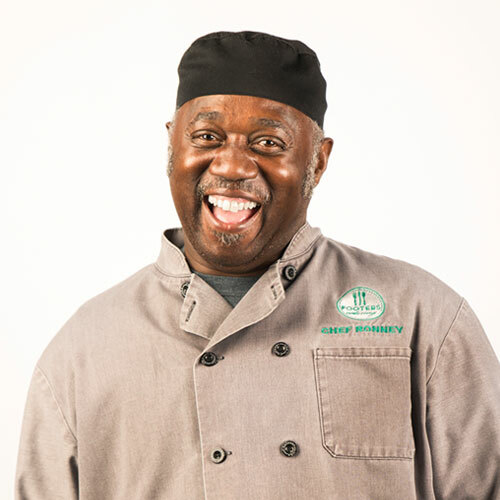 He went to culinary school at Johnson & Wales and joined the Footers Family in 2016. 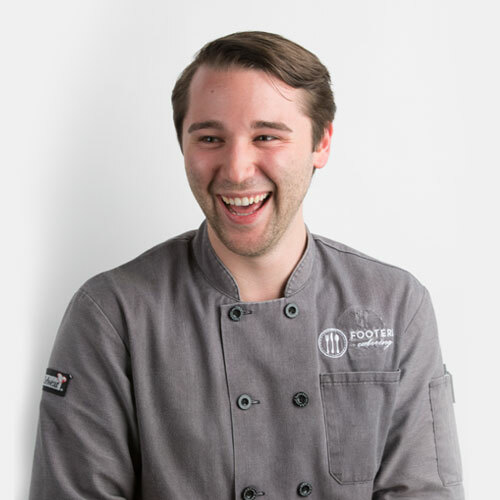 As Lead Tasting Chef, Dylan is passionate about creating memorable experiences for Footers clients and guests at our tasting experiences, and helping design innovative menus for their events! Everyone at Footers knows me for my taste in laid back music! This is a playlist that I like to listen to while I cook to put me in the zone or relax to on my drive home after a long day! Nat was born and raised in western New York, near the grape fields along the shores of lake Erie. He honed his skills for 15 years until moving to Denver in 2014. Having an extensive background in large party events, Nat joined the Footers team in 2014 as a prep cook. He quickly moved on to become a chef de par-tay and to Lead Production Chef in the kitchen where he oversees food prep for the week and manages production. Nat loves getting to see all of Colorado through venues and events and looks forward to expanding his repertoire ever more in the future! When I'm leading the culinary prep team, these are my favorite songs to pump up the crew to help us crush our daily prep lists! 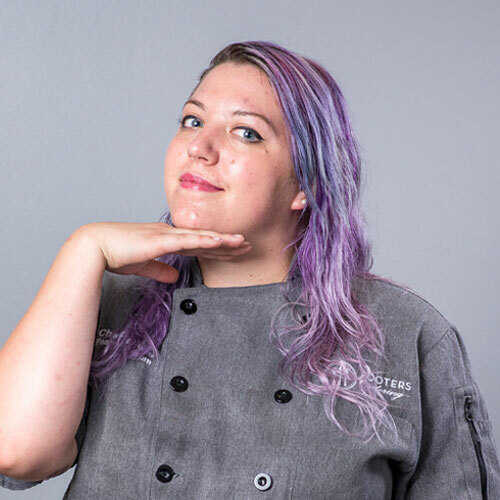 Bryce got her passion for food and baking from her mom, and after 10 years of at-home baking she decided to make the move to go to culinary school. She graduated from The Art Institute of Colorado in early 2016, and took to the catering world immediately. Bryce loves the diversity every day has to offer as the Pastry Unicorn at Footers! This is a small selection of the long list of songs that can come on any time and will, without fail, improve my mood. I love to sing along to songs, and I probably know most or all of the words to all of these songs. They're my jams. Tessa has always been fueled by creativity. Art class was her favorite subject growing up, which led her to study textile design at the Kansas City Art Institute and the University of Kansas. While in college, she worked as a sous chef at Evan Williams Catering to sharpen her skills in the kitchen. Her adventurous spirit took her to Colorado to pursue a career in the tech industry, where she instilled and supported company culture initiatives. Her passion for food brought her back into the kitchen in 2017, when she joined the Footers Family. She believes great places to work embrace their Core Values, but the best ones are like Footers, who recognize the importance of FUN! Each song on my playlist reminds me of a very fond memory and a person that's very special to me. Stephanie is a born and raised Colorado native and graduate of Johnson and Wales with a degree in Baking and Pastry. 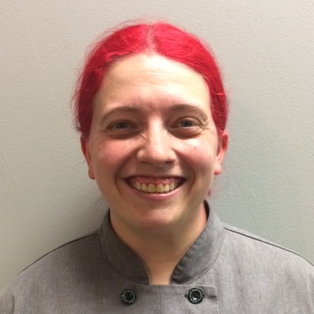 Stephanie is fascinated with learning everything she can from sweet to savory, Tastings, inventory, menu creation, and being a Lead Chef. There is always something new to learn and she is always up for any challenge! Daniel is a left handed middle child with 5 siblings, all of which he stays as close as possible with. 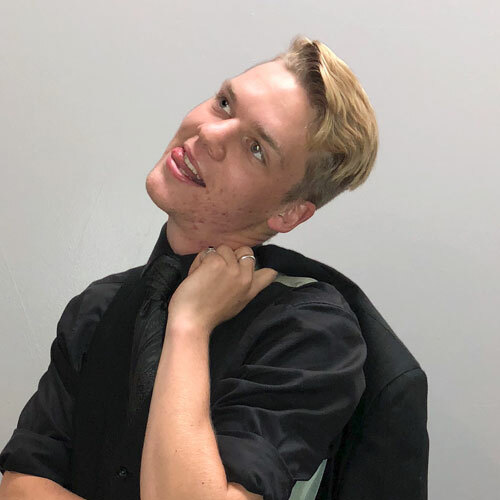 He was home-schooled throughout high school and is currently working towards his Bachelor's of Science in Event and Meeting Management. In his free time, Daniel enjoys dancing, martial arts, competitive sword fighting, shopping and spending time meeting new people. He is excited to learn and grow with the Footers Family for years to come! Cory's passion for event management is apparent as she has worked in weddings and special events since graduating college with a degree in Fashion Merchandising and Hospitality. Outside of work, this Colorado native loves to say she "bleeds blue and orange" and spending time with her family. Want to join the Footers family?